Integrity is not just our name. It is our reputation and way of life. We are in business to serve and help you. Gary and his wife have lived in the Kansas City area all their lives. Having been married for over 43 years we know what integrity, service, and standing behind our work means. If we did not stand behind our work we would not offer free phone consultation even after the inspection is finished. On this page we can only list a small portion of qualifications and experience. If you want to discuss some of the past projects that Gary has been involved in just call us. Projects such as; Space Shuttle support vehicles for NASA, Special Purpose Ordinance Vehicles for Navel Surface Weapons Center, Patents on detachable gooseneck trailers, tank retrievers for the Egyptian army, his experience as Engineering Maintenance Manager working for the 3rd largest printer in the United States, or his experience in building and remodeling homes and churches. . .
We are insured - both liability and E & O insurance. It is just another way to stand behind our work. We offer inspections from dawn to dusk and can usually work around your schedule. We have a female inspector (now retired) that can be present during your inspection (for the safety and security of concerned female home buyers, sellers, or agents) at no extra cost. We offer Whole House, Termite, Radon Inspections, and Radon Mitigation Systems in both Kansas and Missouri without using subcontractors. You only need to hire one inspector for your inspection and Radon System needs. We offer Radon inspections with the latest continuous monitor equipment from Sun Nuclear Inc. and test with CERTIFIED Inspectors and Monitors in accordance with EPA and NRPP protocols for Radon testing (check out your Radon Inspector and make sure they are certified for both measurement and analysis before testing). As of August 2014 there were only 24 certified measurement providers in the Kansas City area listed with NRPP and NRSB for both measurement and analytical services. (check out who is certified for both types of certifications "S" and "A" at www.radongas.org and RMS at NRSB). Remember - We stand behind our work and offer free phone consultation after the inspection is finished. We are a company with service that doesn't stop when your inspection is done. Gary started building and remodeling homes in the 70s and 80s. He was performing commercial inspections back in 1986, specializing in commercial equipment and structural steel including overhead cranes, hoists, conveyors, and hydraulic elevators. For almost 20 years he was the Engineering Maintenance Manager for the Kansas City area operations of the 3rd largest printer in the United States - in charge of all their grounds, buildings, and production equipment. Over the years, he has personally built and remodeled several homes and helped build and remodeled churchs. He was asked to perform home inspections for home buyers before it was his main profession. Now with all his experience, it was only natural to switch his focus from commercial and production facilities, to the homeowner. Along with other training, we were personally trained by one of the oldest and best home inspectors in the Kansas City area with over 29,000 inspections and more than 30 years experience of full time home inspections. Trained by the best to be the best. Our protocols for inspections are time tested to insure that your home inspection will be the best value for your money. To maintain our licenses and certifications we also complete additional training every year. Gary belongs to the International Association of Certified Home Inspectors, the largest organization of home inspectors - NACHI ID # 091211901. Committed to continuing education, NACHI has been recognized by many organizations including the State of Kansas with Standards of Practice and educational courses that complied with the Kansas State Board of Home Inspectors law (a law that recently sunset with the Governers' veto - a license that was good until 12-31-2013). For more information check out our status at www.nachi.org. Gary holds a State of Missouri Certified Non-Commercial Applicator’s License for Category 7b wood destroying insects (Termites) as required by law for termite inspections - License No N5733, and also holds the Kansas 7a reciprocal Commercial Pesticide Applicator Certification - Certification No 21629. He has found all types of wood destroying insects on his inspections and has posted a few pictures on the W.D.I. page. Make sure your inspector has a license for the state they are working in (we have found that many inspectors are not licensed in both states). Gary was trained by Kansas State University / Minnesota University Radon Consortium and passed the exams covering Radon Measurement and Mitigation. He is also certified by NRPP (National Radon Proficiency Program - now administered by AARST). This is a Radon certification program in the United States recognized by the US Environmental Protection Agency and the State of Kansas to train and certify Radon service providers. Integrity Building Inspections uses Radon testing equipment that is type approved, calibrated by Sun Nuclear Inc., and type performance tested by Bowser – Morner, an approved independent National Radiation Reference Laboratory, in accordance with Quality Assurance protocols and NRPP certification procedures. Gary's Measurement Certification is NRPP ID # 105598RT and Mitigation Certification is #106196RMT. You can verify his certifications at http://www.nrpp.info/ (nrpp.info). He is also licensed by NRPP and holds the Kansas Measurement License KS-MS-0057 and Mitigation License KS-MI-0013. As of August 2014 there were only 24 Radon inspectors in the Kansas City area who are certified to perform both measurement and analysis, with NRPP and NRSB. Per EPA protocol, everyone else should be sending their results out to a 3rd party before they report their findings. Be sure your Radon inspector is certified for both types of services by checking them out with their certification organization (NRPP or NRSB). The new law in Kansas that went into effect July 1, 2011 requires testing according to this protocol. 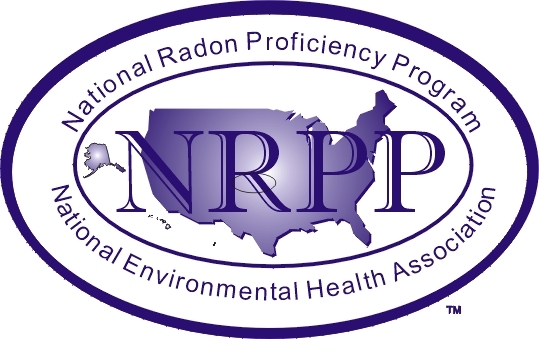 We perform our Radon tests consistent with National Radon Proficiency Program (NRPP), and Environmental Protection Agency (EPA) procedural protocols EPA 520-402-R-92-004; US EPA 1992, and EPA 402-R-93-003; US EPA 1993, Office of Air and Radiation. We install Radon Mitigation Systems in accordance with US EPA 402-R-93-078. For additional information see our RADON PAGE or RADON MITIGATION page You can also obtain the Home Buyer’s and Seller’s Guide to Radon (EPA 402-K-05-005 EPA 1995) and the Citizen’s Guide to Radon (EPA 402-K02-006 EPA2005) at www.epa.gov/radon. Gary was registered with the Kansas Home Inspector Registration Board and held registration No 0310-0151 back when it was required. - NOTE this law has now sunset as of July 1, 2013 and the current license from Kansas expired on 12-31-2013. Formerly all inspections in the State of Kansas, by Kansas law, had to be performed with an inspector that was registered with the Kansas Board, and complied with Kansas Home Inspectors Professional Competence and Financial Responsibility Act. This law went into effect on January 1st, 2010 and expired on July 1, 2013. At Integrity Building Inspections, we will continue to follow NACHI Standards of Practice that are much more strict and complete. Our contract states what Standards of Practice we follow in our inspections. We will continue to exceed the requirements that were part of the former Kansas Law (HB 2260) and exceed their exceptions that were part of Section 1. K.S.A. 2008 Supp. 58-4502 (c) (1)). At Integrity Building Inspections we believe that our customers want a quality inspection performed to National Standards of the industry, not an inspection performed to comply to poorly written Kansas rules and a contradictory law that had been modified, amended, with rules that were determined unconstitutional by the Kansas Attorney General (in his Opinion No 2009-5) and then finally vetoed by the Governor of the State of Kansas . Our Standards of Practice have lasted longer than Kansas State Law concerning home inspections. There are many private organizations that will "certify" an inspector or list them with their organization if you pay their fee, pass their test, and abide by their rules. We deliberately screen many inspectors in the KC area and found that they do not follow the Standards of Practice and Code of Ethics of the trade organization they joined and post on their web site. At Integrity Building Inspections we give you the best inspection for your money. Just belonging to one of the many trade organizations and being listed with them with their logo does not mean you get a quality inspection. You need an inspector with the skills and knowledge we offer at Integrity Building Inspections. Integrity is not just our name, it is in everything we do.